The candles are sold as a set of three. Most colors are offered as a set with the three shades of the color as shown. Some of the colors are only a single shade such as "Eggplant". The candles are 10", 12" & 14" tall. These are our classic teardrop form. The base of these candles is a circle. All prices include Free Shipping in continental US. Your order will normally be shipped by Fed Ex Ground. We hope you love your candles. If you have any questions or problems please let us know. Your unburned candles can be returned or exchanged within 60 days of shipping. If you need to return or exchange the candles, please call us first. SCROLL DOWN the page to see all the available colors. We also offer special pricing on cases of 6 sets. Click the button for information on case quantities. A case of 6 sets is a great way to complete your gift shopping and still have something for yourself. For the contrasting color sets, each set is composed of a light, medium and dark shade of the color. We randomly select the combination for each set that we send you. The set you receive may have a tall dark, and a short light candle in the set, or it may be a different combination such as a tall light, medium medium and short dark. This set has a tall medium and short dark candle. While this set has a tall dark and a short light shade. 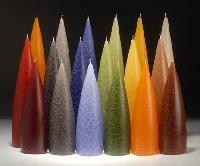 The following Colors are only available with a single shade for all of the candles in the set. Set of three candles in smooth BLACK. Black does not have a crackle finish. We also offer special pricing on cases of 6 sets of the same style. Buy 5 sets and get 1 set FREE. Click the button to order a case.